A garage door breakdown is definitely a problem you don't want to have to deal with. Read on for a number of suggestions from us that should prevent a system failure from taking you by surprise one morning! To ensure the parts involved in the opening and closing of the door continue to run properly, it is a good idea to lubricate them on a fairly regular basis. The motor inside the opener shouldn't be sprayed, but lubricant can be applied to the rollers, hinges, and springs. We recommend you do this a minimum of a couple times a year. Your automatic door has a safety feature built into it - a closing door should reverse its action if it feels pressure beneath it. You can test this functionality by placing an item like a broom beneath the door as it's closing, if it fails to reverse, it may be that the sensors need aligning or that the amount of pressure needed to force the opening needs to be adjusted. We recommend additional weather seals for the bottom and sides of your garage door. This will protect against moisture which can get inside your system and cause it to deteriorate, it will also provide another level of security against small animals and insects. One of the most common problems homeowners come to us with is a worn or snapped spring - when your spring breaks completely, there'll be no operating your door. The springs are responsible for the heavy lifting of your door - to check they're in good condition, you can use test them during a manual operation. 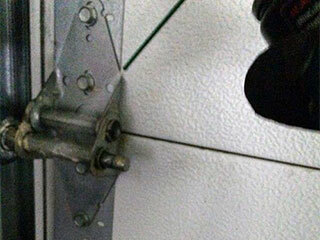 The door should open and close smoothly without sagging. If you notice tension problems or serious alignment issues, it's probably time to call a professional to take a look. Contact our team at Garage Door Repair Orange Park with all your overhead door related queries. We can help troubleshoot an issue you're having, carry out minor or major repair work, perform safety tests or install a new component for you if needed.